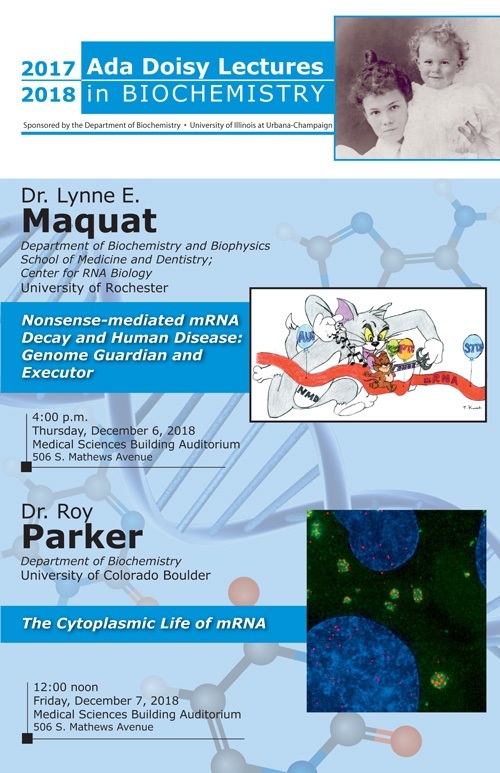 “Nonsense-mediated mRNA decay and human disease: Genome guardian and executor"
The Ada Doisy Lectures in Biochemistry were established by the late Edward A. Doisy in honor of his mother Ada Doisy, whom he credited with instilling his love and reverence for learning and inquiry. Edward Doisy (1893-1986) received his Bachelor's degree in 1914 and his Master's degree in 1916 from the University of Illinois; he received his Ph.D. from Harvard University in 1920. Dr. Doisy was on the faculty at Washington University School of Medicine from 1920 to 1924. In 1924 he moved to the St. Louis University School of Medicine, to assume the headship of the Department of Biochemistry. He remained Head until his retirement in 1965. Among many contributions to natural products and nutritional chemistry, Dr. Doisy isolated and synthesized vitamin K, and for this work he received the Nobel Prize in Physiology or Medicine in 1943, shared with Henrik Dam of Denmark. Dr. Doisy was awarded the Illinois Achievement Award by the University of Illinois Alumni Association in 1958, and received an honorary degree from the University of Illinois in 1960. Dr. Doisy endowed the Ada Doisy Lectures in 1970, and it has been the pleasure and good fortune of the Department of Biochemistry to host them annually since then. The Ada Doisy Lectures are one of the most distinguished lectureships in the life sciences. Doisy Lecturers have been recognized by twenty Nobel Prizes and one Crafoord Prize, an equivalent to the Nobel Prize for areas not covered by it. Twelve of these awards were announced after invitation as Doisy Lecturers.